It was a busy weekend for both of us - Jake spent most of his time at the Museum of the Moving Image attending a David Cronenberg retrospective while Silka worked on various freelance projects - so for Sunday's dinner we planned to keep it classic and simple. 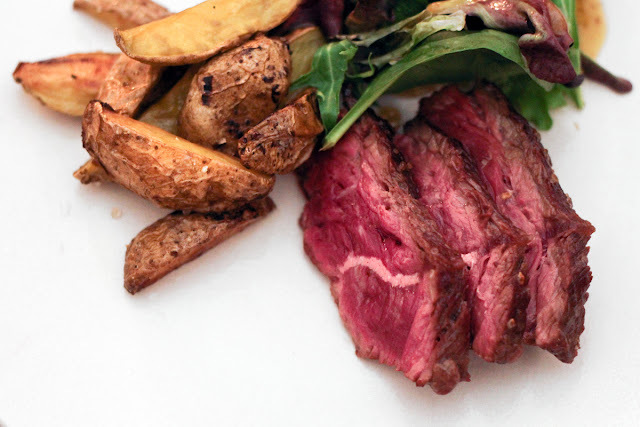 What's more classic, simple or just plain better than a French Bistro-style steak? Let us answer that for you...nothing! This particular steak dinner was also an excuse to vet yet another new beef stand at the Market - Sun Fed Beef. When getting to know a new beef farm, we'll try out one of our three most commonly cooked steaks - sirloin, hanger, or London broil. Sun Fed's hanger looked really beautiful so we went for it. Now, it's no secret that we like a strong taste of iron in our beef, which is really to say that we like the taste of blood. And no steak has a stronger, beefier, bloodier taste than the hanger. It's actually known as the "Butchers' Steak" because there is only one per animal and traditionally butchers would take it home for themselves. Well, Sun Fed's steak did not disappoint! It was beefy, tender and beautifully cut. 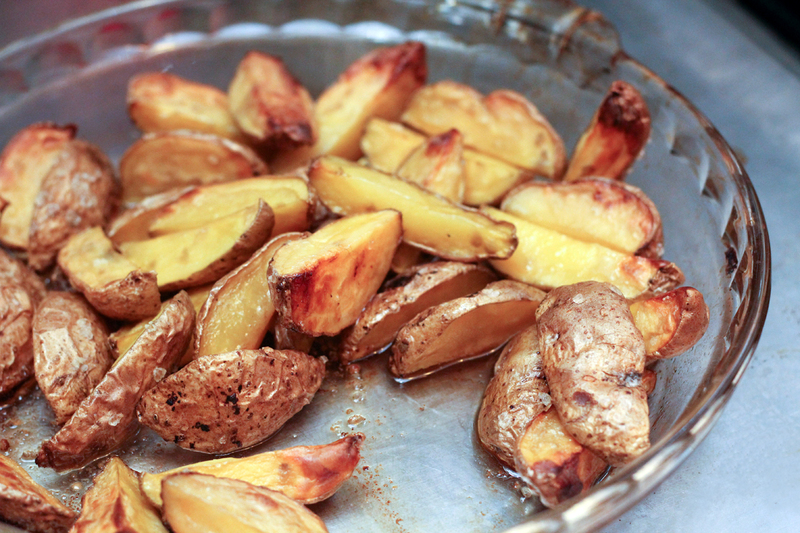 We paired it with some perfectly roasted fingerlings, mixed greens and a stiff drink and settled into a cozy Sunday evening. 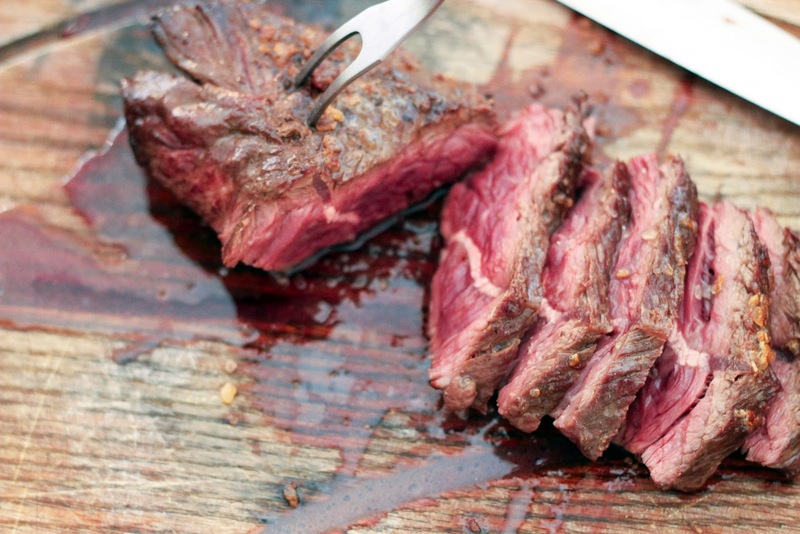 Even though steak is incredibly easy to cook, many people seem to be intimidated by it. The directions below are a sure-fire way to make the most of your steak. We use a meat thermometer, but you'll be fine without one. 1. 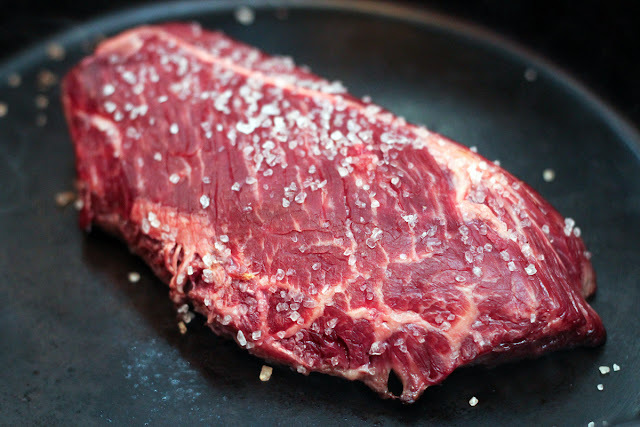 An hour before cooking, remove steak from refrigerator and let come to room temperature. 30 minutes before, preheat your oven to 350 degrees. 2. Pat steak dry with paper towel and salt heavily. 3. Place a dry oven-safe skilled on high-heat. When smoke starts to come off the pan, add steak. Sear on one side for about 90 seconds - the steak is ready to flip when it releases itself from the bottom of the pan. Flip onto other side for another 90 seconds. 4. 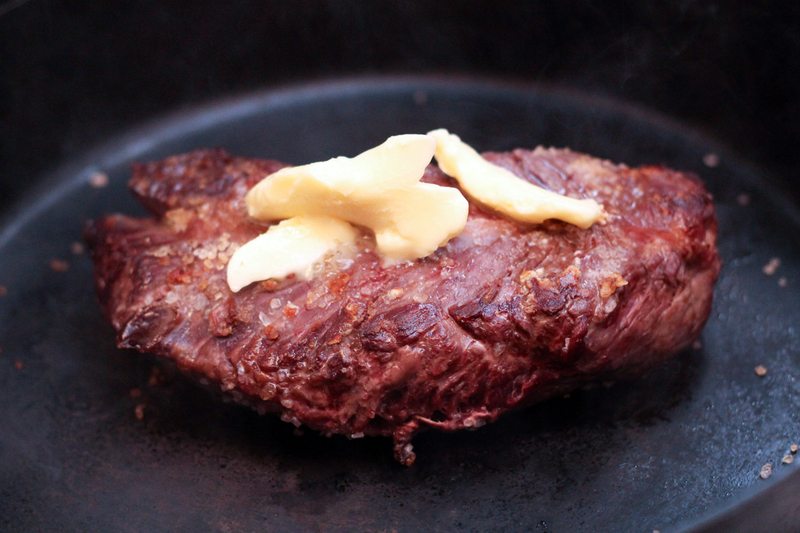 Place a tablespoon of butter on top of the steak. Remove pan from stove top and put in oven. Roast for about 7 minutes for rare. If you are using a digital thermometer, cook to 120. We use the kind that you can keep in the meat while it's cooking. 5. 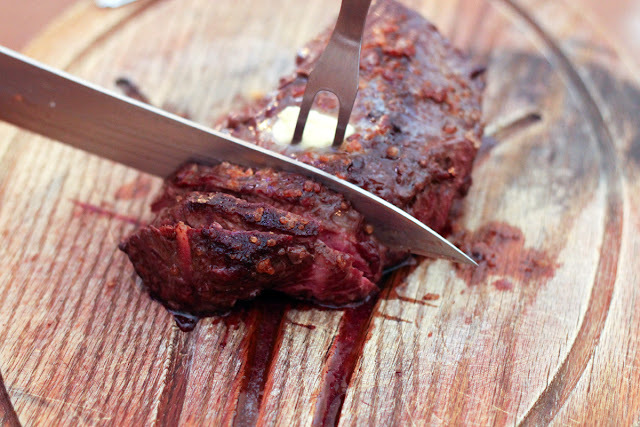 Remove steak from pan immediately and place on cutting board. Add the remaining tablespoon of butter on top, top with freshly ground pepper and let rest for another 7 minutes before serving. Gorgeous. At the end of the day, NOTHING beats a good steak prepared simply like this. I don't cook hangar steak often, but I'm thinking I might visit the Organic Butcher and pick one up.